Elbow flexion brings the forearm up at the elbow joint with the wrist and hand in either supinated, pronated or neutral range or any degree in between. Forward flexion at the glenohumeral joint brings the arm straight up in front of the body in the sagittal plane. Supination of the forearm at the proximal radioulnar joint rotates the forearm outward as in turning the palm upward or turning the thumb away from the midline of the body. In Horizontal adduction the biceps brachii helps bring the arms together, as in a dumbbell chest fly. In Shoulder abduction, the biceps brachii helps raise the arms to the side, as in a standing dumbbell fly or lateral raise. Radial tuberosity of the radius. The insertion is on the medial side of the forearm. Bicipital aponeurosis — fascia of the medial side of the forearm. Both insertions produce a tendency toward supination of the forearm. 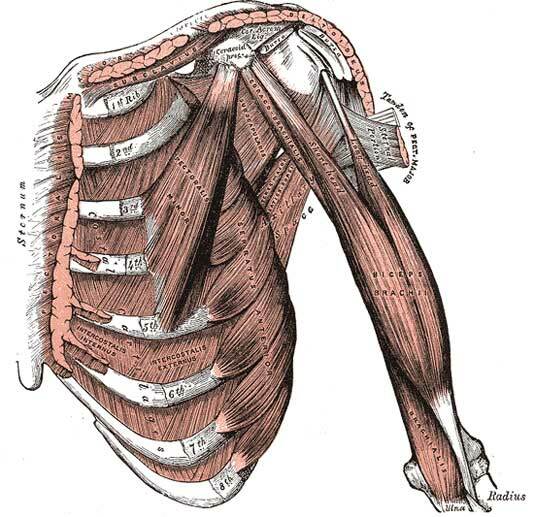 Biceps brachii is a Latin phrase describing a “two-headed (muscle) of the arm” — each head with its own origin at the shoulder, but with a common insertion near the elbow. The word ‘Bicep’ is an incorrect word that is commonly manufactured on the names of exercise machines and is incorrectly used to describe one arm doing a biceps curl or to describe using the muscle in singular form. The word Biceps is correctly used in both singular and plural form. Elbow flexion is a Third-Class Lever with the Biceps Brachii muscle producing the generated force input between the fulcrum (elbow joint) at one end of the lever and the load (at the forearm, hand & wrist) at the other end of the lever. Shoulder flexion is also a Third-Class Lever with both the Biceps Brachii muscle producing the generated force input between the fulcrum (glenohumeral joint) at one end of the lever and the load (at the arm, hand & wrist) at the other end of the lever. The biceps reflex test is used to help understand possible pathology at the level of C5/6 or at some point above it in the spinal cord or brain. The biceps reflex test uses a tap with a tendon hammer to quickly depress and causes a shape change of the biceps brachii tendon where it passes through the antecubital fossa. The test quickly activates stretch receptors inside the biceps brachii muscle which communicates mainly with the C5 spinal nerve and partially with the C6 spinal nerve to induce a reflex contraction of the biceps muscle and jerk of the forearm with reflex elbow flexion. A strong contraction indicates a ‘Brisk’ reflex, and a weak or absent reflex is known as a ‘diminished’ reflex. Discovery of brisk reflexes may lead to discovery of lesions of upper motor neurones. Absent or reduced reflexes may lead to discovery of lower motor neurone lesions. The reflex is helpful in understanding the use of fast stretching and slow stretching of a muscle in strengthening or weakening a specific muscle in healthy individuals exercising for fitness and sports performance. More study is needed to determine if fast stretching activates a reflex contraction and possibly strengthens the muscle force generated. A slow, prolonged stretch may weaken and diminish the reflex reaction of the force produced by a muscle.